The MLB season is back in full swing and there are plenty of intriguing storylines heading into this new season. For the first time since 1908, the Chicago Cubs are the defending World Series Champions and looked primed and ready to repeat their success this upcoming year. However, teams like the Cleveland Indians, who the Cubs defeated to win the World Series this past October, have other plans. Heading into the season, the Cubs are undoubtedly the favorites to recapture the title. Returning stars like Kris Bryant, Anthony Rizzo, and Jon Lester, among others, look to lead the team back to the championship this upcoming fall. This lineup is stacked from top to bottom and any team will be hard pressed to match up with Chicago’s lineup all the way from the leadoff spot to the 8th batter. 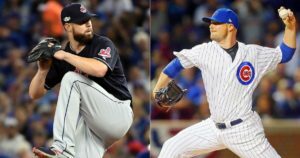 In addition, their pitching staff, which is led by the aforementioned Lester and other stars Jake Arrieta and Kyle Hendricks, is among the best in the league and should play a major role come playoff time. While the Cubs are the favorites in the National League, the Cleveland Indians also looked primed to return to the World Series after a heartbreaking game 7 loss last October. Returning stars Corey Kluber, Francisco Lindor, and Andrew Miller, along with the welcome addition of Edwin Encarnacion, lead the squad and hope that if they are able to make it back, they will gain a different result than their upsetting loss in what was a classic game 7. If these two teams were to meet again, no baseball fan would really be upset. These two teams were so evenly matched and created so much October magic in the past World Series that if they were to run it back it would create no shortage of great baseball between two great teams. After taking a commanding 3-1 lead in the series, the Indians needed just one more victory to etch their names in history and capture their first World Series since 1948. However, the Cubs had different plans as they won games 5 and 6 by scores of 3-2 and 9-3 respectively. Game 7, however, was an absolute classic. With the Cubs winning by a score of 6-4 in the bottom of the 8th inning, things looked bleak for the Indians. However, Rajai Davis, who had only hit 55 home runs in 11 seasons in his career, delivered a game tying home run. After a scoreless 9th inning, the game then went into a rain delay, causing stressful situations for both sides. When the action returned, the Cubs rallied for two more runs in top of the tenth inning and held on to win 8-7. While fans of other teams are undoubtedly rooting for their own teams to make it to the Fall Classic, most baseball fans would be perfectly content with seeing a rematch between the two great teams. It’s a long season, however, and lots can happen. This is, however, the beauty of baseball and is why so many are rejoicing at its return.